Probably the biggest difference between luxury in today’s world and luxury in the past is the relative disappearance of custom or bespoke products. In the 18th and 19th centuries much of what was considered luxury was custom made. The wealthy class purchased custom clothing, had jewelry made to their specifications and even had custom fragrances created for themselves. Today most luxury goods are produced and sold. There are still custom clothiers, shirt makers and boot makers but the common notion of custom made has essentially vanished. This has meant the disappearance for the vast majority of local watchmakers and jewelers, custom dress and shirt makers and other custom made products. Not with this Italian maker of Art Inlay Clocks and Furniture. To follow, enhance and renew the great Italian tradition, harmonize the styles into aesthetic and exclusive results which are totally world famous for the mastery of its workmanship, the inspiration with which it fulfills every project and the sensitivity in treating and arranging the most precious materials. 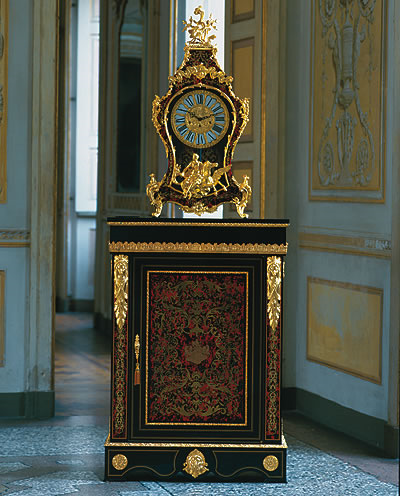 Dimensions: Clock: 18.3″ X 9.8″ X 37.1″ h Mobile Base: 31.2″ X 14″ X 43.7″ h.
Ashanti Interiors is proud to introduce the Wood Boulle chest finely inlaid with black pearwood and red tortoiseshell with an elegant clock in Louis XIV style with decorations in 24 Kt gold plated cast brass: a splendid example of the magnificence with which the Imperials salons were decorated. This is why these wonderful creations embellishes the most beautiful buildings and houses in the world, environments intended for high-level meetings and private rooms where everything refers to the artistic sensitivity and taste of the owner. One in which every work, starting from the extremely famous clocks, establishes a favored dialogue between those who experience it and those who merely observe.